There are very few places in the world who can put forward a genuine, warranted claim to be be the most beautiful place on the planet. And amongst the ones that claim, you would see only the usual suspects – The Galapagos islands perhaps? Maybe one the Thai islands, Krabi? 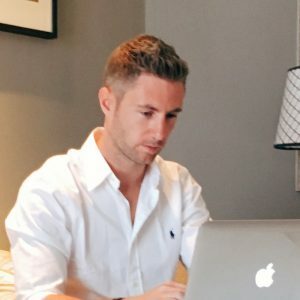 Surely some spots on the Caribbean, St Lucia? Barbados? Greek Santorini too? The Mediterranean coast would claim a few spots I’m sure. And rightly so, amazing destinations, each and every one. The one thing they all share is just that the world is well aware just how beautiful they are, and so they’re inundated with tourists, McDonalds, Starbucks, selfie-sticks and overpriced fridge magnets. Imagine then a place equally as beautiful, even more perhaps, certainly more unique, and with a culture so warm you won’t want to leave, flora and fauna straight out of Avatar found nowhere else but here. And then imagine you’re the only tourist there. Literally the only one. 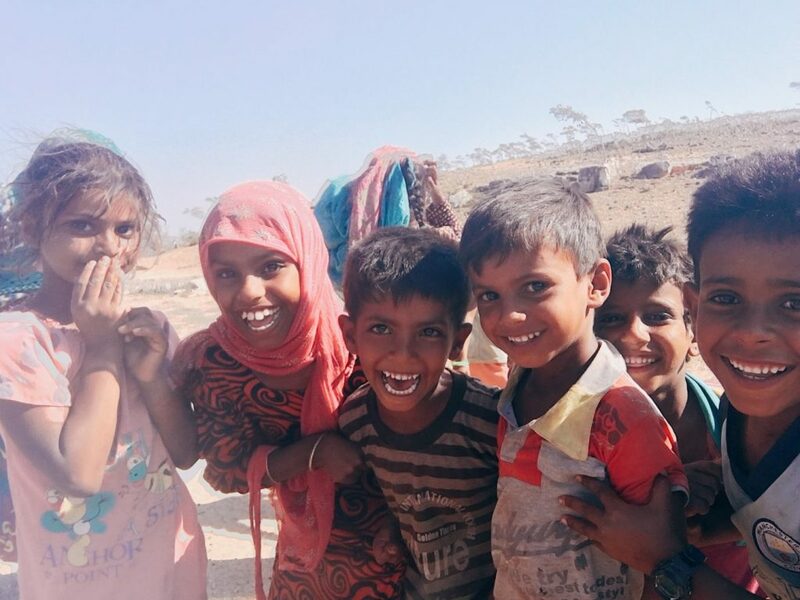 This was my phenomenal experience as I visited my 196th country of the 197 countries in the world, Yemen. 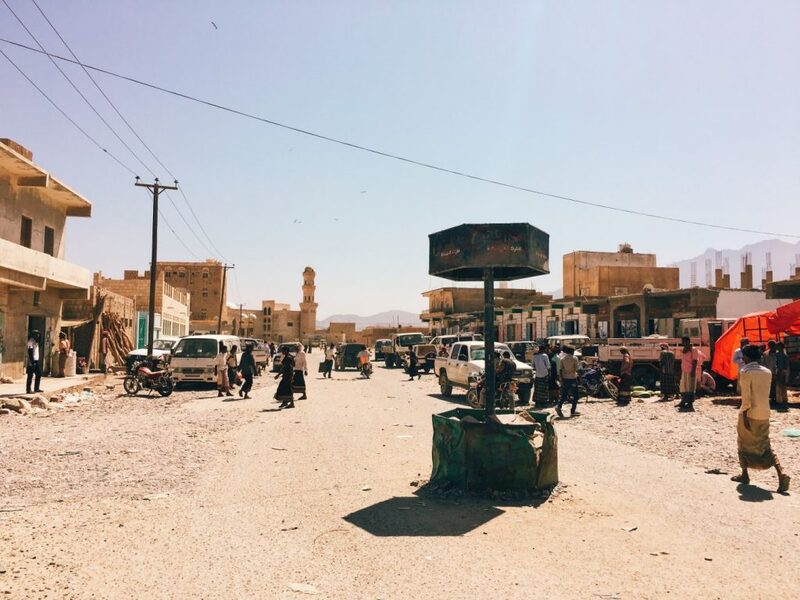 I had tried and failed to visit Yemen 5 times in my quest to finally visit every country. 9 months of failures. The war sadly shows no signs of calming down, visas are hard to come by, Al Qaeda have moved into the power vacuum and the proxy battles played out between Sunni Saudi Arabia and Shi’a Iran rumble on. 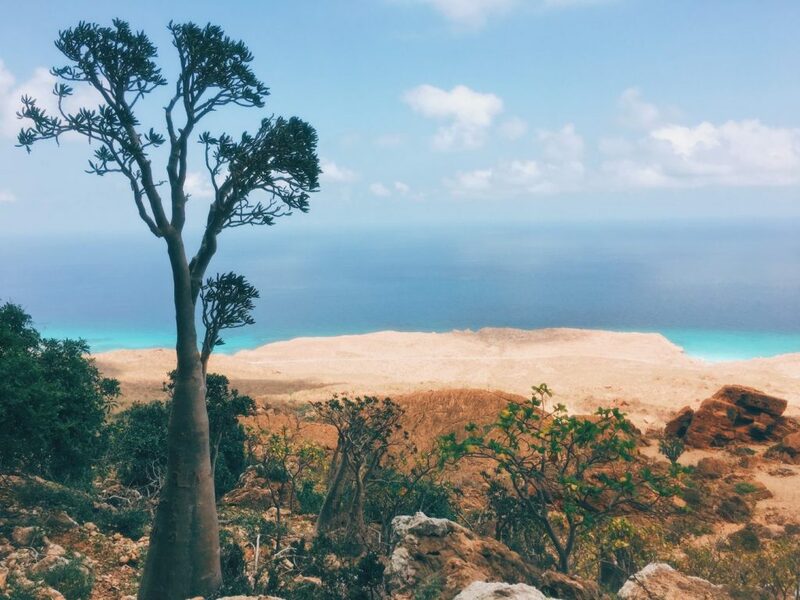 Yet Socotra, a Yemeni island off the coast of Somalia, remains a beacon of hope for Yemen. No war, no extremism, no political vacuums, yet as a Yemeni island, they are tarred with the same war-zone brush. 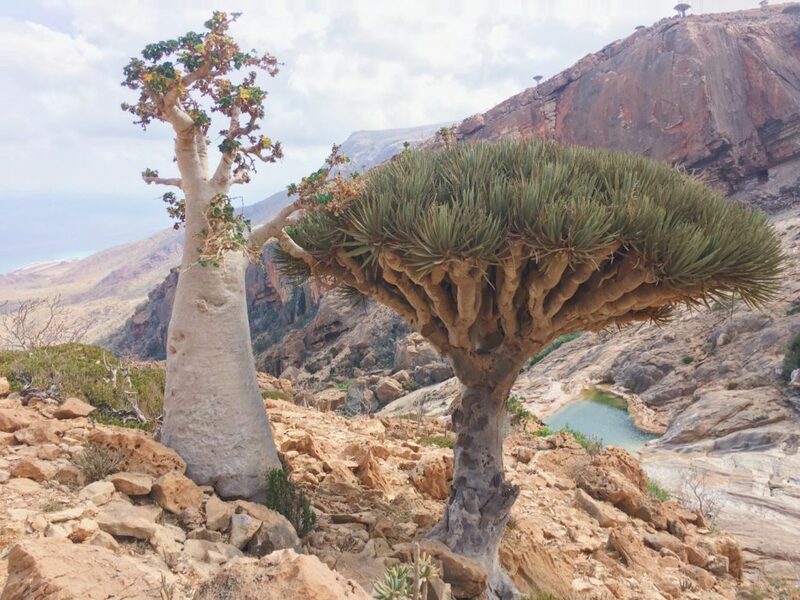 The no-fly zone inflicted upon Yemen applies to Socotra too, so despite it being entirely safe, there is no way to get to the island. 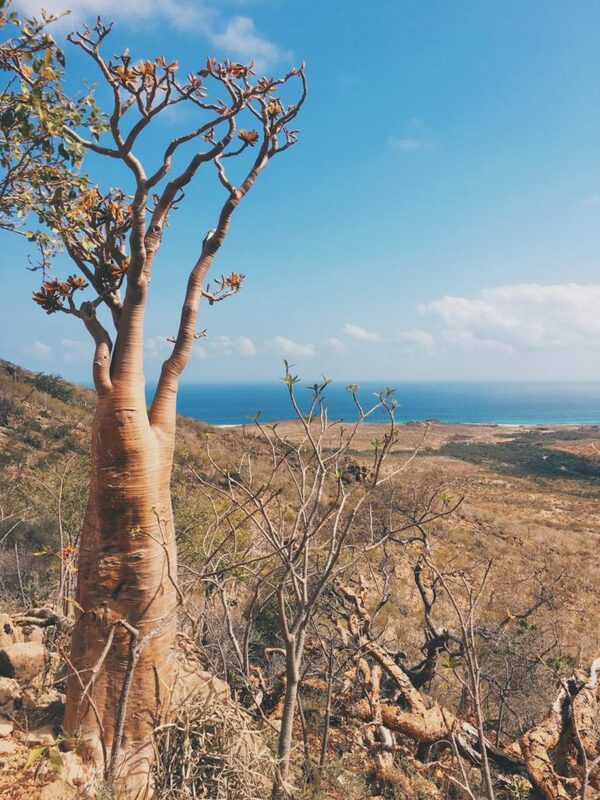 On top of that, Socotra is waiting. Waiting for the world to discover it. Waiting to be announced as a new wonder. Waiting and wondering why it isn’t world famous already. 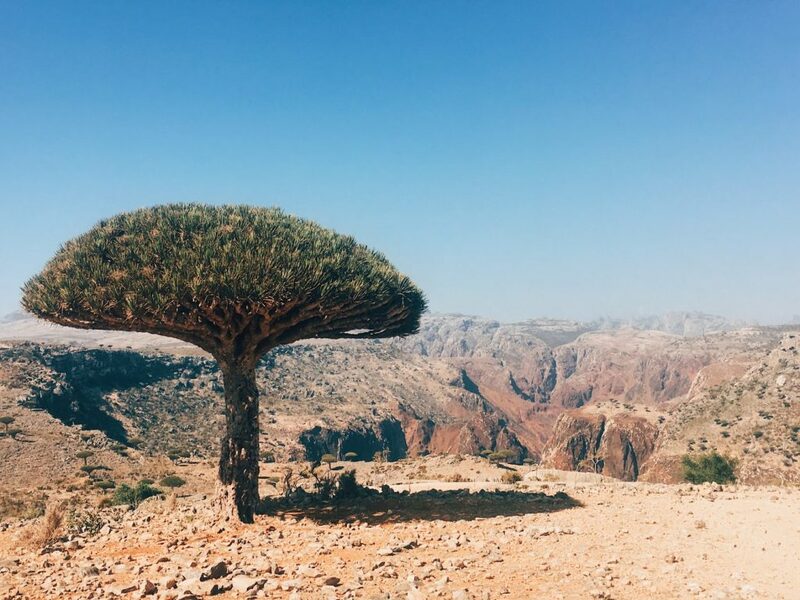 Because Socotra is a place like no other I’ve ever been, it’s main draw for hard-core travelers are the beguiling ‘Dragon Blood Trees’, looking as if they’re almost upside down, they are found nowhere else on the planet. Ever since I had heard of these trees, it had been number 1 on my bucket list, but I just couldn’t find a way to get there. Finally, my relentless stubbornness paid off, 5 trips to Salalah (a port town in Oman that borders Yemen), and 5 failed attempts at Yemen, far too much time and money, but on my 6th attempt finally fate dealt me a winning hand. It came in the shape of Socotri-Yemeni guy called YahYa, who, to cut a very long story short, became a friend and in turn managed to organize me to hitch a ride with a fishing boat-turned-cement-transporter from Oman to Socotra (you can read how we managed to organize that crazy journey here). 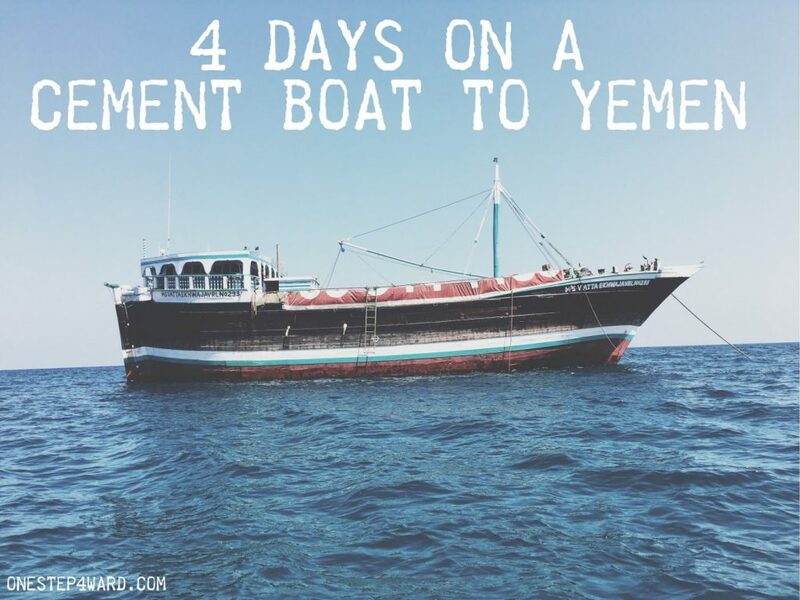 And so that’s how I ended up spending 4 days and 100+ hours on a cement boat to Yemen and back, it was pretty tough journey in honesty, quite the adventure, and worth every last bit of the effort. That being said, the fears of anything from being kidnapped by Al Qaeda, hijacked by Somali Pirates and/or our little wooden boat sinking, were never far away. Anyway, I boarded the cement boat around 4pm on Wednesday afternoon, sleeping on top of the roof of the boat, under the stars, dodging cockroaches, living off biscuits and water to avoid the dodgiest looking toilet I have ever seen, 50 hours later, at sunset on Friday evening I laid eyes on the island of Socotra, I could see the huge sand dunes from 30k or 40km away as we approached. A school of dolphins escorted the boat in the last 10km or so and before long I was whisked off onto a smaller boat with an immigration official to the port. Wow, I was really here, 196/197, Yemen I finally got you. 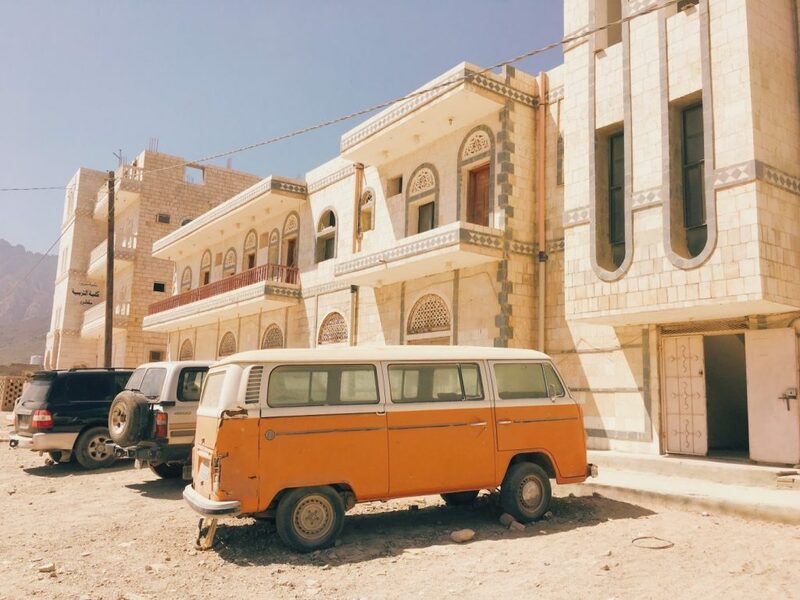 YahYa had organized someone to meet me at the port, organized all my immigration processes on my behalf, organized my guest house in Hadibo, Socotra’s ‘capital’ and organized his Uncle Ahmed Eisa to meet me for dinner in the guest house. 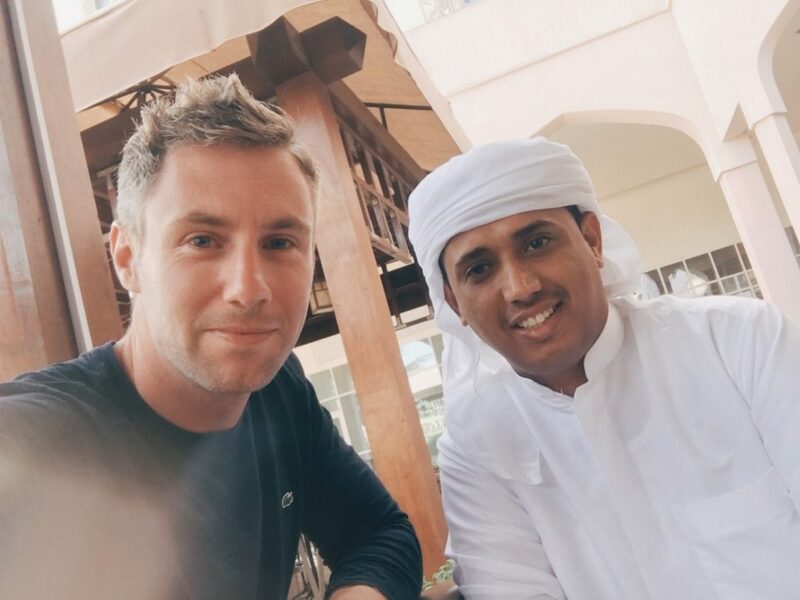 Arriving in a strange new country, I couldn’t have asked for more, so I checked in and Ahmed and I went to dinner for a chat as I got my head around just where in the world I was. YahYa and me on the morning i got back from Socotra! 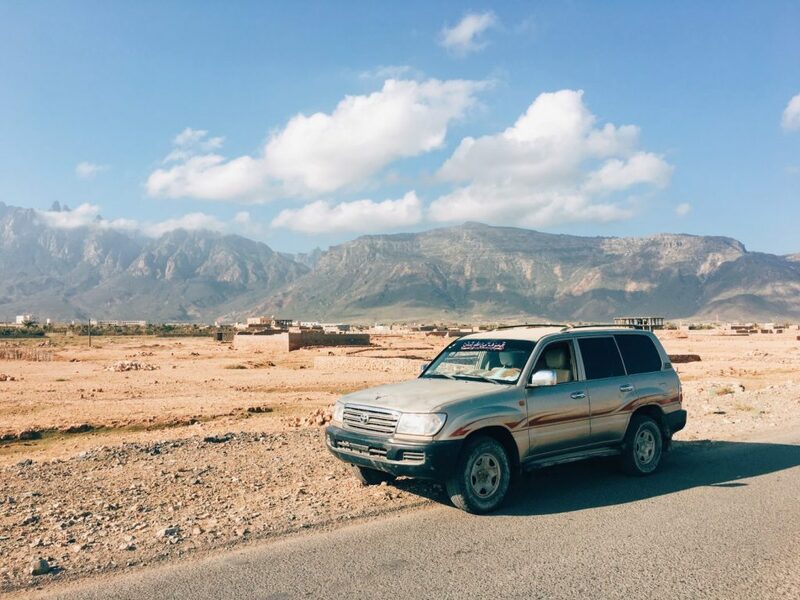 I didn’t know how long I would be staying in Socotra as the only way off the island was by my cement boat, and if I missed my boat back, I could be stuck here for weeks. That meant that I had to maximize my time on the island, in the end I stayed 4 nights and organizing the cement boat back was almost as complicated as getting here, but we managed it thanks to Ahmed. That gave me 3 days to explore as much as I could possibly see, and we made the most of it. For me, this was the highlight of the whole trip. 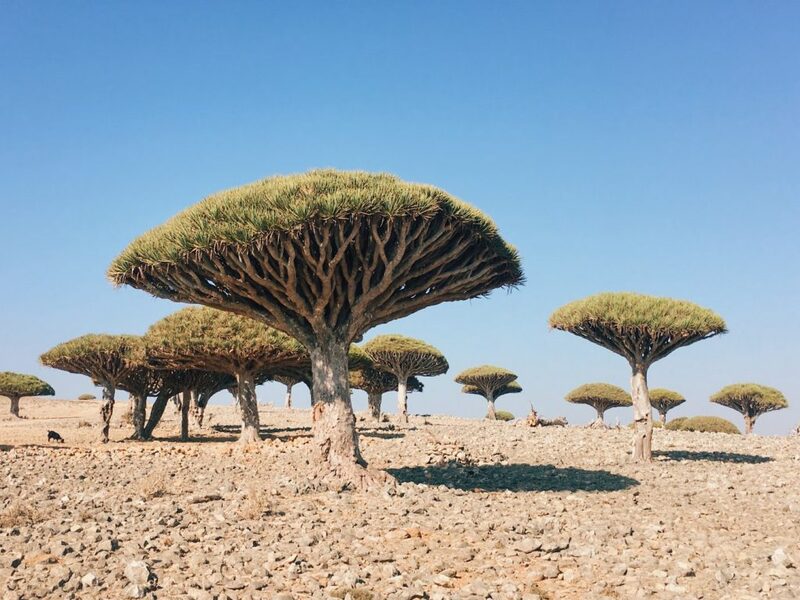 I have google-image-seached the Dragon Blood Trees more times than I can count, so I was so excited to see even just 1. 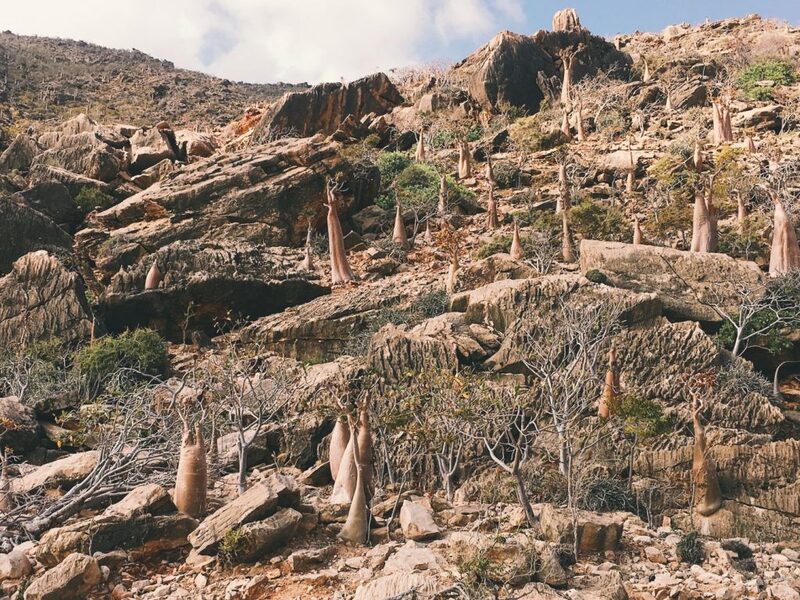 As we drove to the centre of the island to Diksom, my guide told me we were going to see a forest of Dragon Blood Trees, I was so excited, and it didn’t disappoint. We drive slowly off road, and the local kids see a foreigner and go crazy, screaming and laughing and joking, chasing the car barefoot as we drive onwards. There is an amazing canyon right in front of us, so I ask can we stop and take a photo, that’s when I see a couple of the Dragon Bloods dotted around, with the canyon providing the background, and the kids chasing us, it couldn’t have been more perfect. I bought some dragon blood resin from the kids, took a few photos and then jumped back in the car for another 5 minutes until we hit the main spot. Wow. 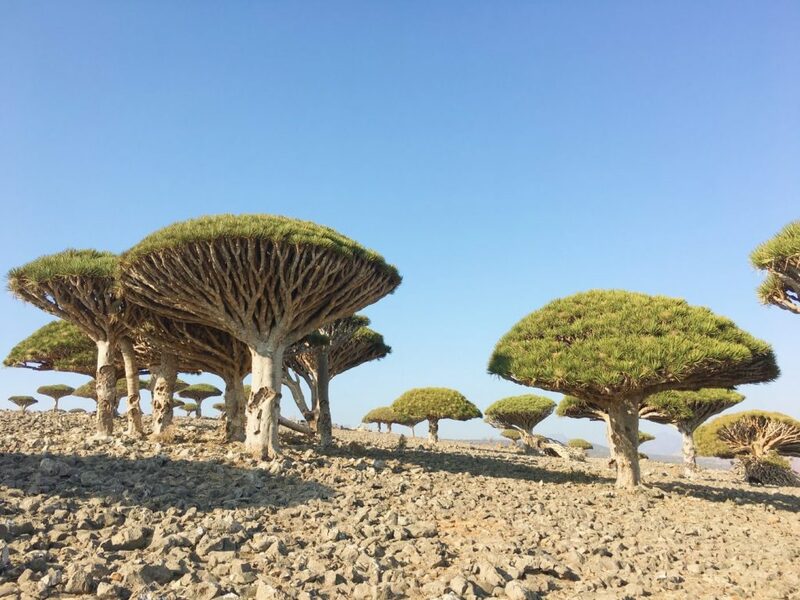 It really was a forest of Dragon Blood trees. They were everywhere, as far as the eye could see. Not only was I surrounded by them but all the fields in the distance were covered by these beauties. There are no new Dragon Bloods, with thousands of free roaming mountain goats quickly ending any hope of newly planted trees, and the large trees are around 800 years old. Once they’re gone, they’re gone. It’s a saddening reality, but it only acts as a bigger motivator to cherish them while we have them. The forest is breath-taking, you can’t walk 10m without bumping into one of the trees, and you can’t stop yourself snapping the same photo 1000 times! I was in my element and ending up spending a long time just soaking it up. One of the best things I’ve ever seen in my life, and again I was the only person in the whole area. 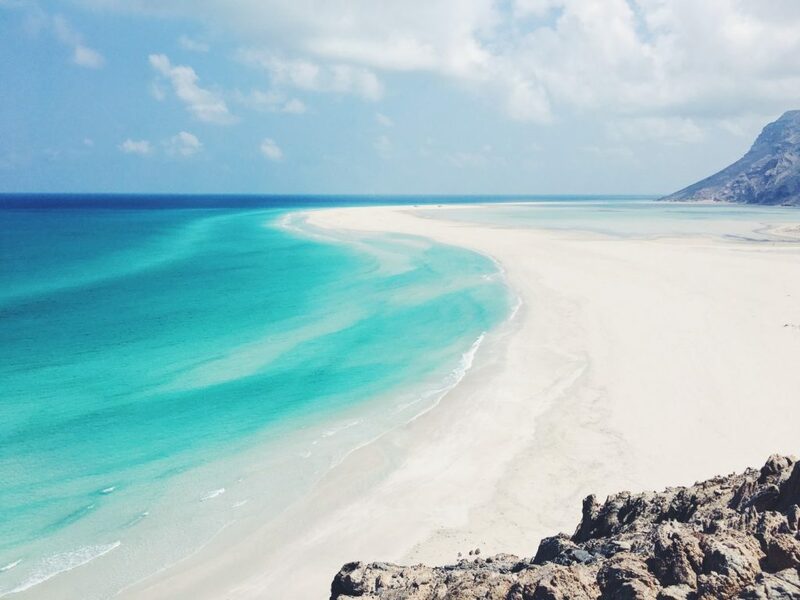 I didn’t know anything about Socotra’s beaches before I came, but having seen the colour of the water as I arrived by boat, I knew they would be special. Even still I wasn’t quite prepared for the beauty of Kalansia. We drove from Hadibo, the capital, all the way to the extreme east of the island, about 2 hours or so (and the ride is gorgeous, through the countryside, local villages, then through the mountains, unreal), as we arrived in the car I could see the electric blue water and thought “Yeah, this is pretty nice”. Then we reached the hill and looked down onto the sand bank “Woaaaah”, I literally shouted inside the car. “Holy sh*t”. 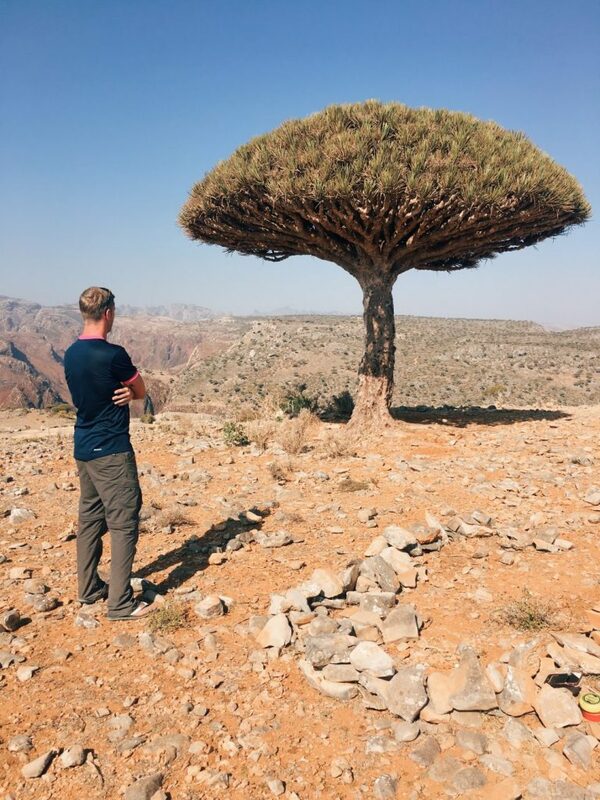 It’s not done yet, my guide sent me up small mountain, scrambling up the boulders in my flip-flops, no health and safety in Yemen I promise you that. From the top was the most spectacular beach view I’ve maybe ever seen. 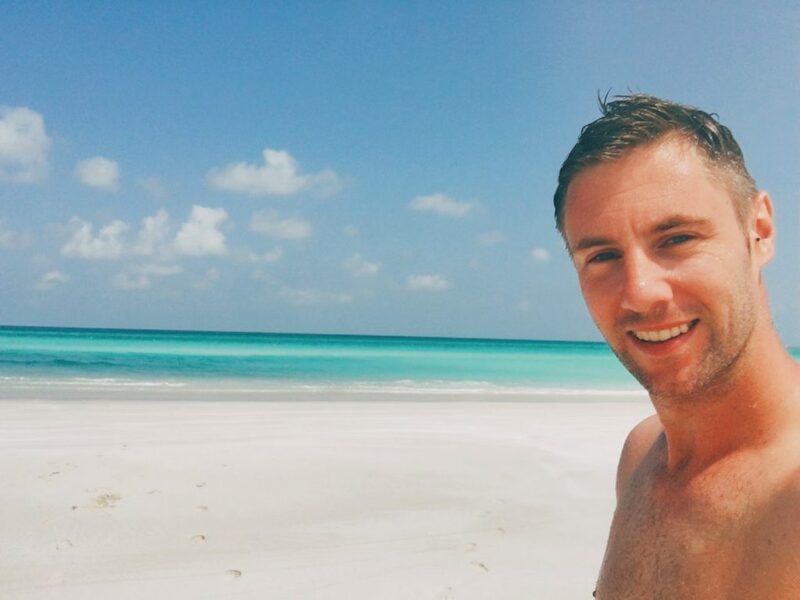 Untouched white sand beaches, stretching over 1km, with the most ridiculously blue water. I stood ontop that mountain for at least 20 minutes just staring out, I could’t believe it. I climbed down, switched into my swimmers, and dove in. Just beautiful. 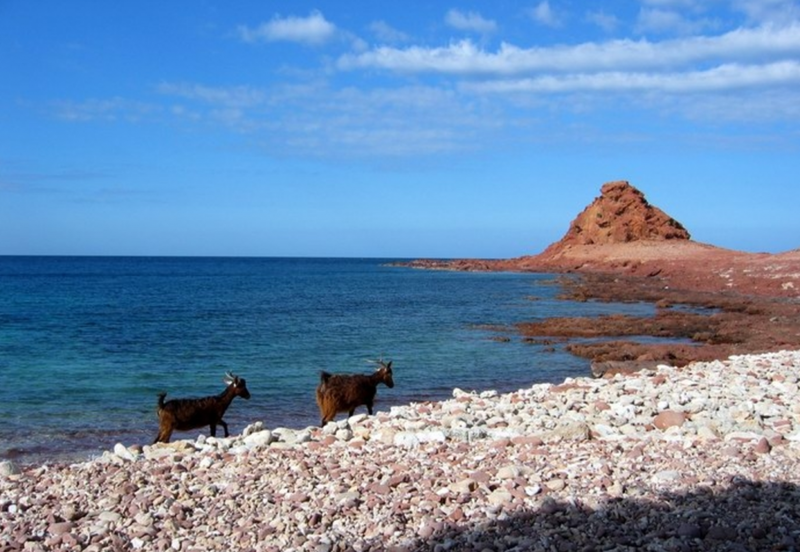 If you ask a Socotri their favourite spot on the island, they all seem to say Homh Hill and it’s pretty easy to see why. Drive east from Hadibo for about an hour, hire a local guide from the village to hike the hill with you and back (about 3 hours, $12) and you’re on your way. 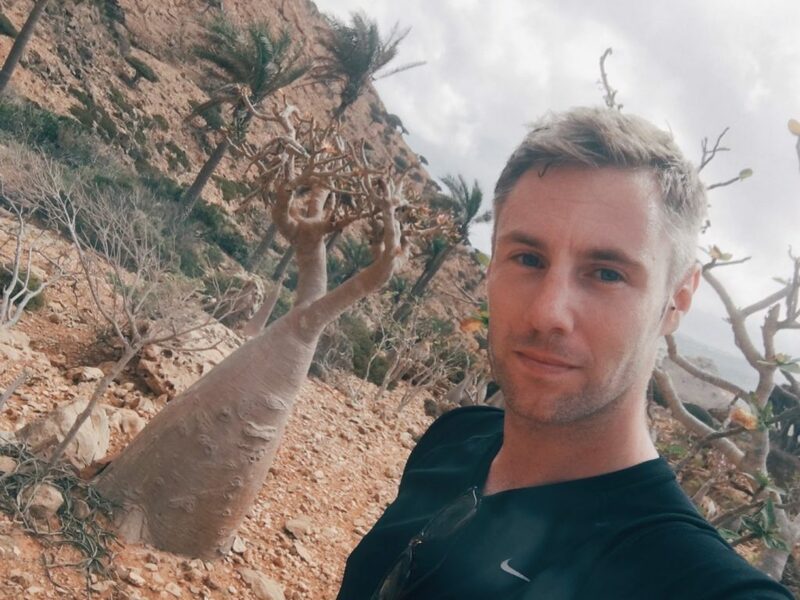 The hike is fascinating, the famous bottle trees are dotted around everywhere and after about 20 mins of uphill ‘walking’ you start the ascent up the cliff face. 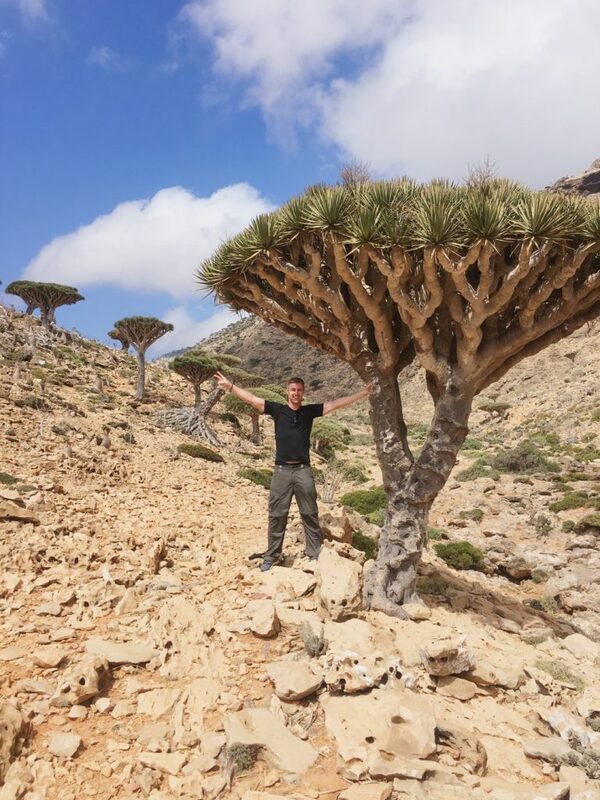 It’s quite tough, and it’s hot, but after 30 minutes more or so, you turn around and you’re rewarded with quite spectacular views of the coast, carry on 5 minutes more and you bump into a Dragon Blood tree beside a bottle tree, which marks the home of the mini fresh water lake. 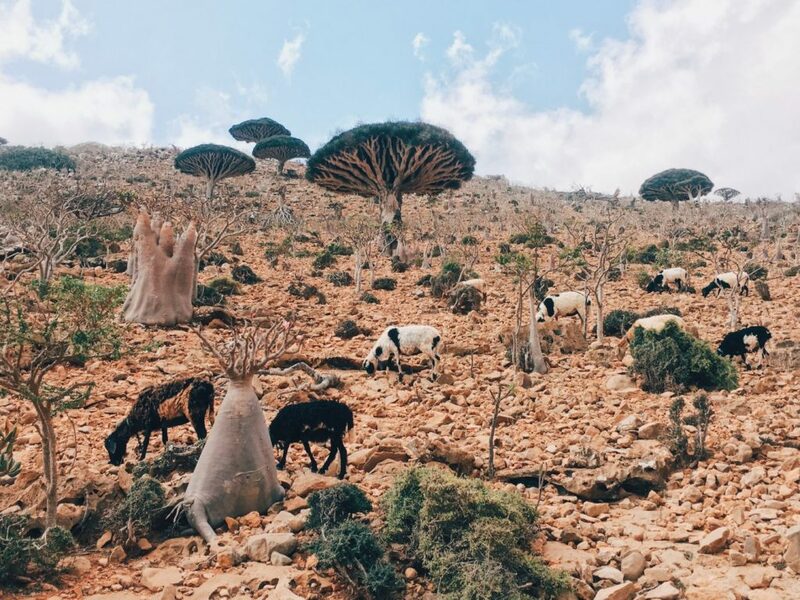 Honestly, Socotra is insane, it’s as if it’s been designed by a traveler. This little fresh water lake is a natural infinity pool overlooking the spectacular view, placed perfectly. A well earned break from the hike. 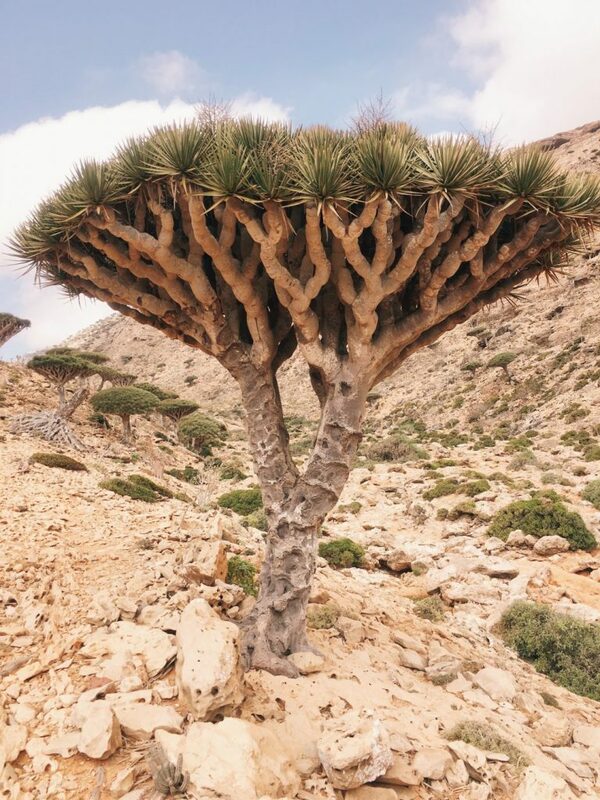 Onwards you go to Homh Hill proper and you get to the main event, Dragon Blood Trees dotted everywhere around the mountain landscape, it’s quite the sight. A million photos later and you come to the Frankincense plateau. Waking at your own pace, you can take a break, after a bite to eat then turn around and set back to where you started from. Watch out for the Hibiscus plants on the way down, I fell into one and it’s like being stung by 100 nettles, horrible! 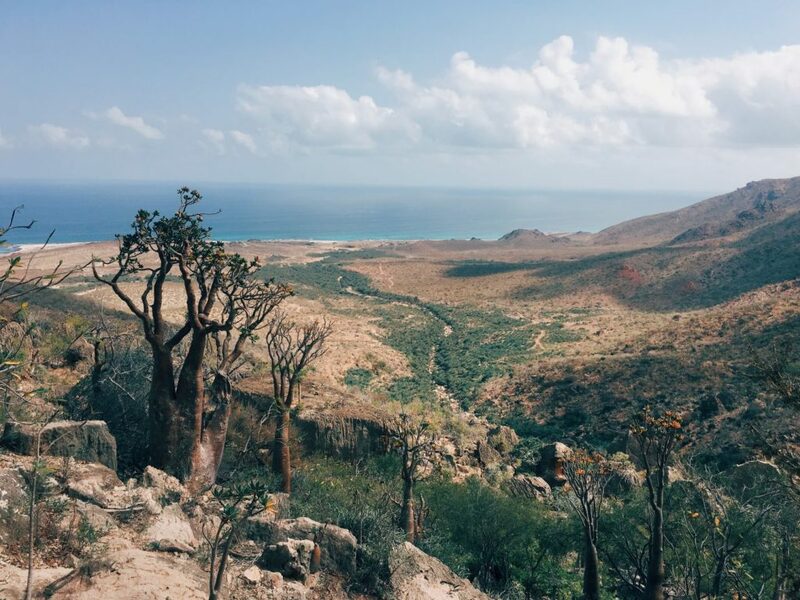 Perhaps the hardest hike you’ll do in Socotra, Hoq Cave is about 90 minute drive east from Hadibo. 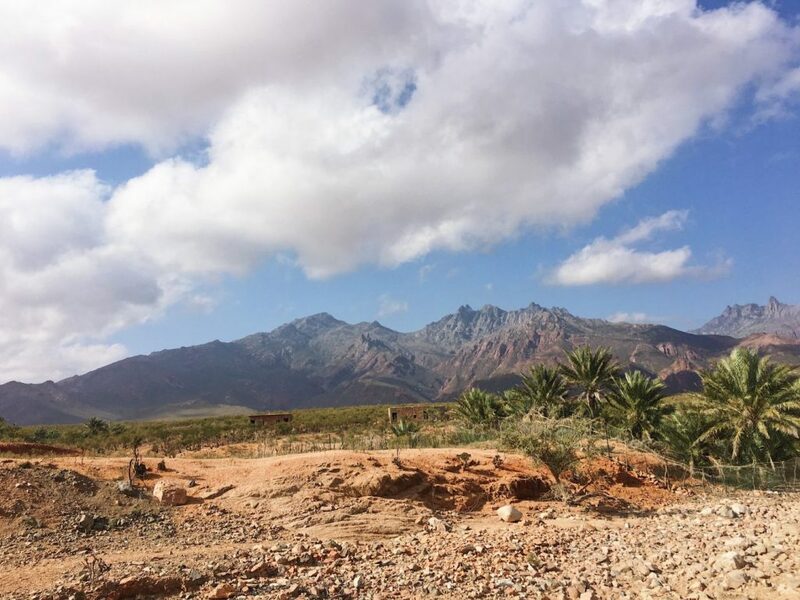 You can stop in the local village for a tea with the guys, then hire one of them to put you through the punishment of climbing the mountain and discovering Hoq Cave (2-4 hours, $18). The hike is tough going, and it’s really quite steep, thankfully I was more prepared than usual and had opted for sneakers instead of flipflops for a change. I was feeling quite fit but after 30 minute of climbing or so, I was sweating like crazy and breathing heavily, Mohammed, my 15 year old guide, looked like he was out for a leisurely stroll, it put me very much in my place on the island! Once you reach the mouth of the cave, you once again get rewarded with the most expansive views of the amazing landscape and coast. I took a long time drinking it in/recovering from the hike, then we switched on our torches and entered Hoq cave. The cave stretched on over 2km, and it’s pitch black. You can walk the whole 2km freely, it’s impressive inside with huge, HUGE stalagmites and stalactites. 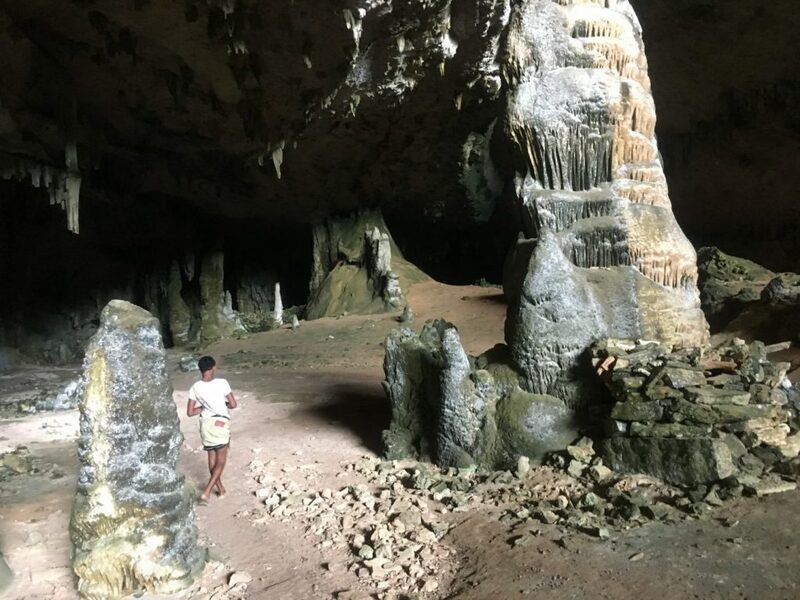 A cave like this in Ireland, or Thailand (my 2 homes) would be a massive draw for tourist, and one of the main attractions, here it’s hardly mentioned – that’s Socotra, one island but so many impressive places. 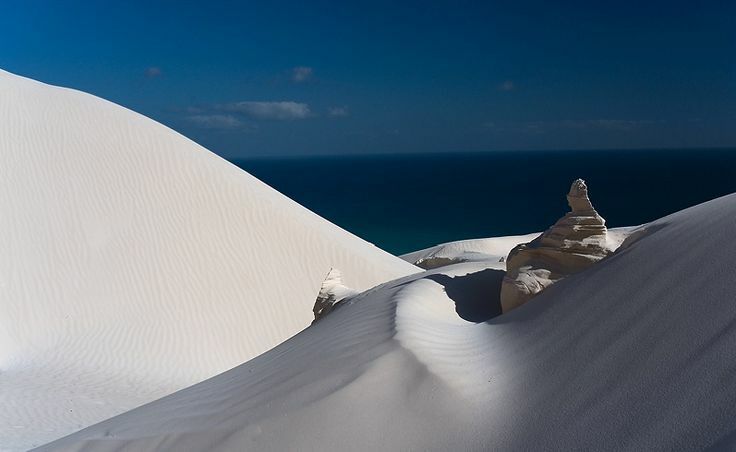 There are 2 sets of dunes on the island, one on the west and one of the east, both are great. The ones on the east are the dunes I visited, and if you stay longer you can actually camp on the dunes, when I come back I’ll definitely do that. For such a small island to have so much diversity is quite frankly insane, and you could walk into the dunes, and take pics as if you’re in the Sahara in Morocco, with the vast undulating dunes. Perfect. 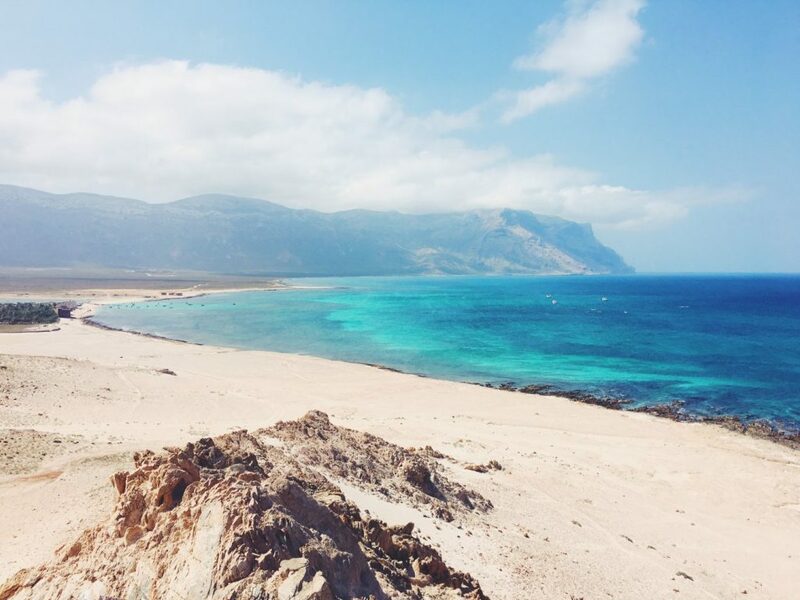 This was the first beach I visited in Socotra, and it would be much more impressive had I not then seen Kalansia the next day! 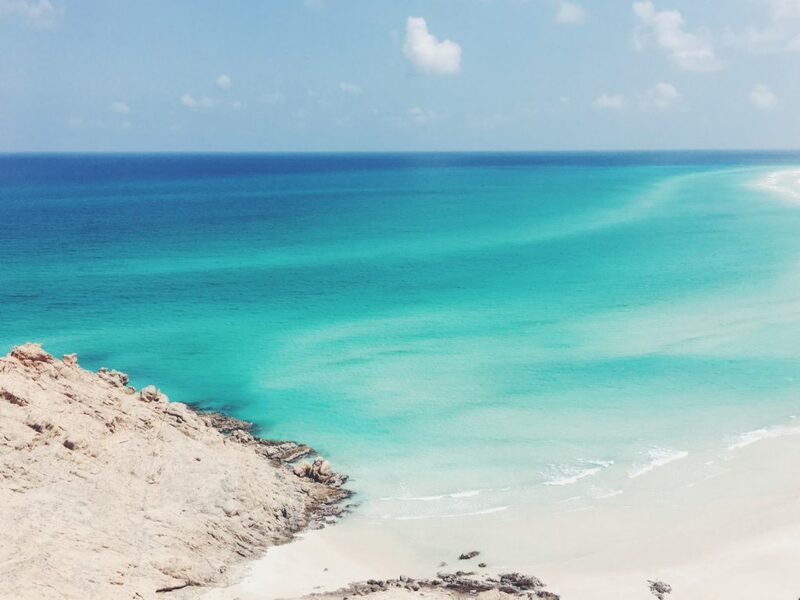 Irsel is the most eastern point in Socotra, and the water is predictably blue and crystal clear. White sand beach too, almost comes as standard here. DiHamri is home to amazing natural coral reefs, so much so that the UN have stepped in to protect the area, a very progressive move indeed. 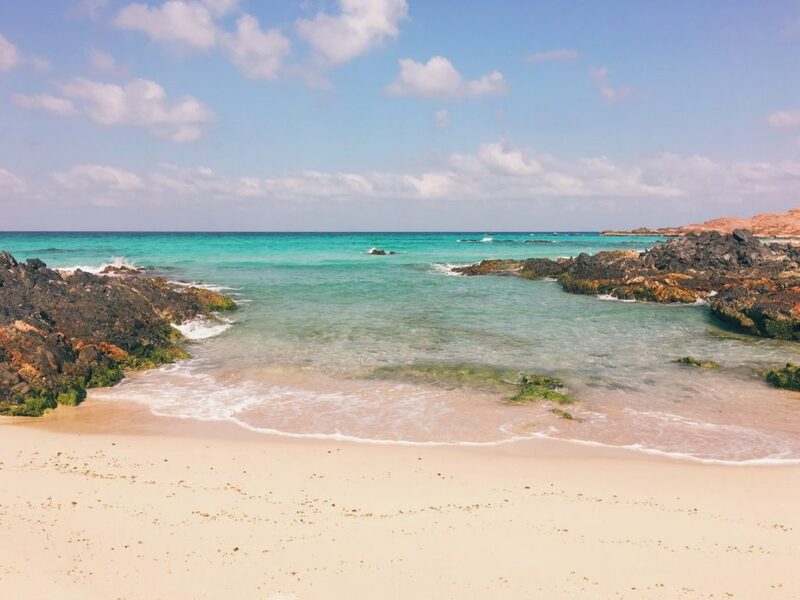 Super colour fish, and a morning spent snorkeling here is a great start to any day. 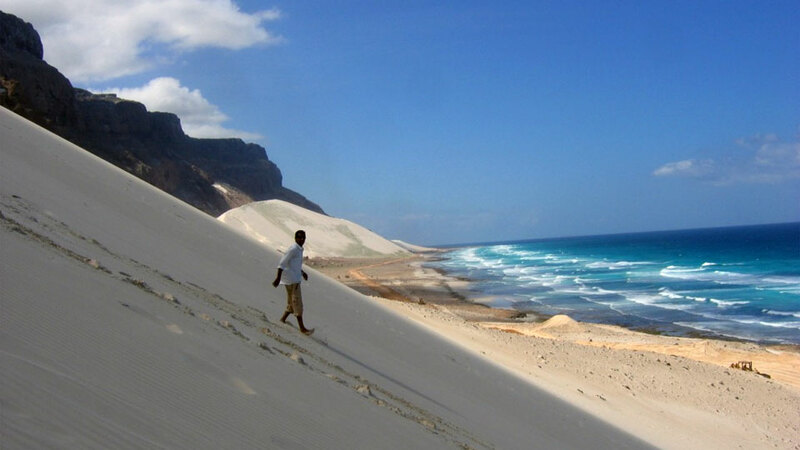 Socotra’s main town, and the only place you’ll get access to a shower or (super slow, GPRS style internet). There are 3 hotels in town, ranging from $10 to $75 per night. There are a handful of tasty restaurants, and I loved eating here each evening. The local people here cannot do enough to welcome you. Shouting hellos from shop windows, from the backs of motorbikes everywhere. 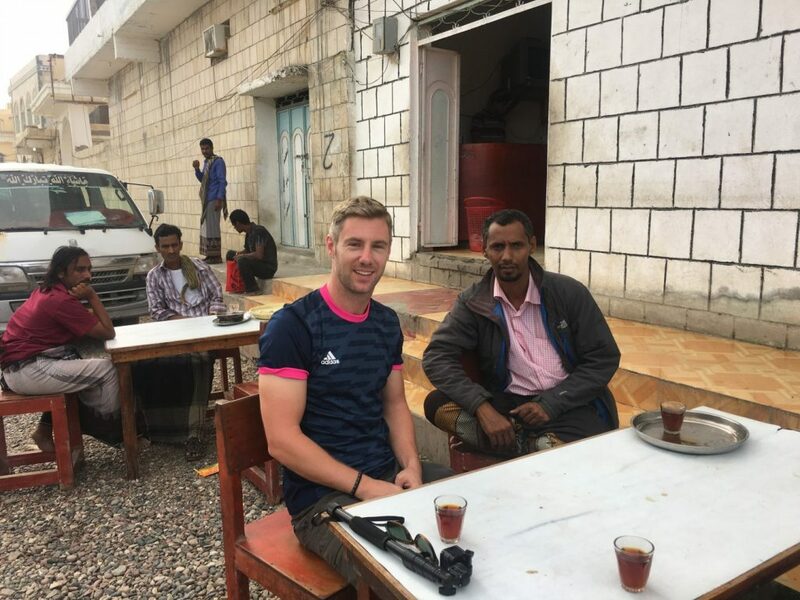 People are so happy to see you, shaking hands, asking you in for tea, it’s a beautiful atmosphere and each evening when I returned to Hadibo, I was happy to be back. It’s a dusty little town, with little sights of note, but it’s a wonderful place to waste an afternoon drinking tea and eating the local food. I look forward to coming back. My 4 nights disappeared in the blink of an eye, and all too soon I was back on my cement boat (from where I’m writing this). 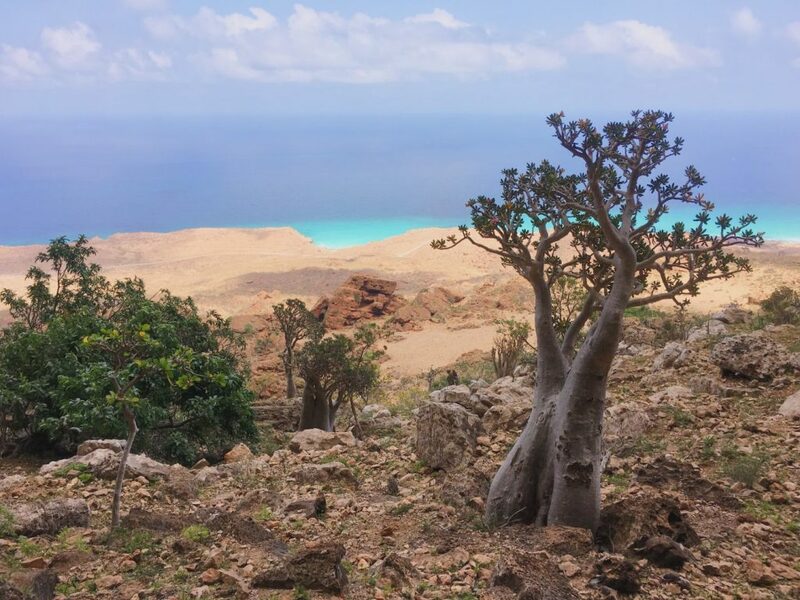 4 nights on the cement boat and 4 nights on the island, seems a little unfair, but 4 nights in Socotra is a huge treat, a privilege in fact. I will definitely be back, and more than that, I would love to run the GiveBackGiveAway here next year, build the kids a playground and bring a group of you guys to come and see this amazing island! No cement boats though, we’ll organize a private boat, or hopefully airlines will resume flying there by then, but seriously, no more cement boats. I’ve had enough of those to last a lifetime! Wow. Amazing story. 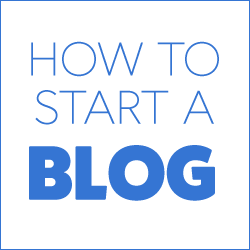 This is my first time reading your blog and I’m loving it. 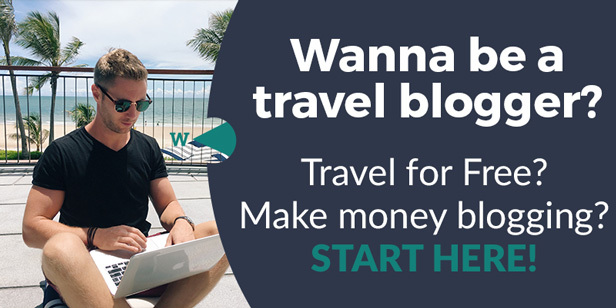 I’m currently working towards traveling to all of the countries though it feels like I’m so far away with only 79 completed. This is definitely now at the top of my bucket list. Thanks!! This seems like an outstanding place, Johnny! Thanks for motivating me to visit it! 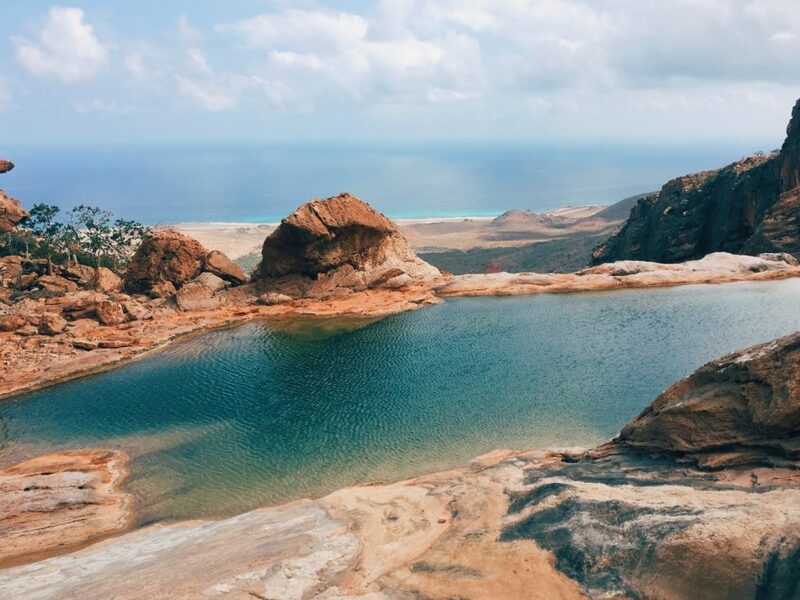 Being the only tourist in a place like Socotra is a commendable achievement. Many many congratulations Johhny on your 196/197. 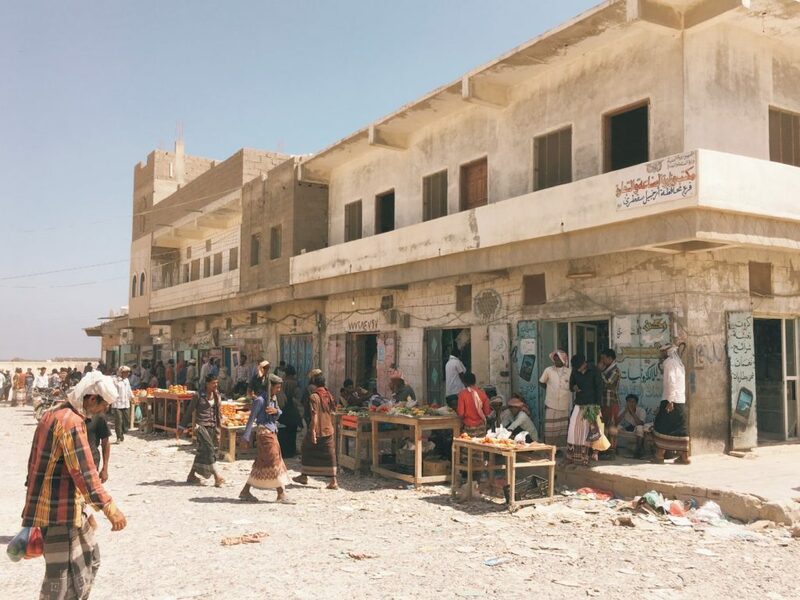 I have a Yemeni colleague with whom I shared this story. 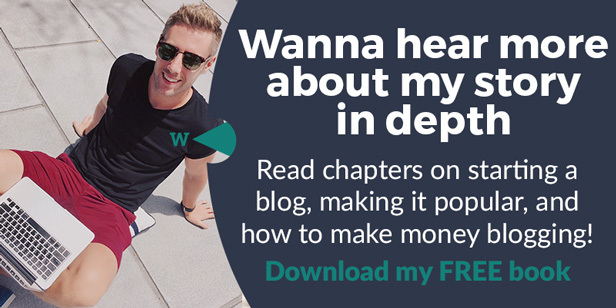 I could see the myriad emotions bursting through his face as we went through the story. 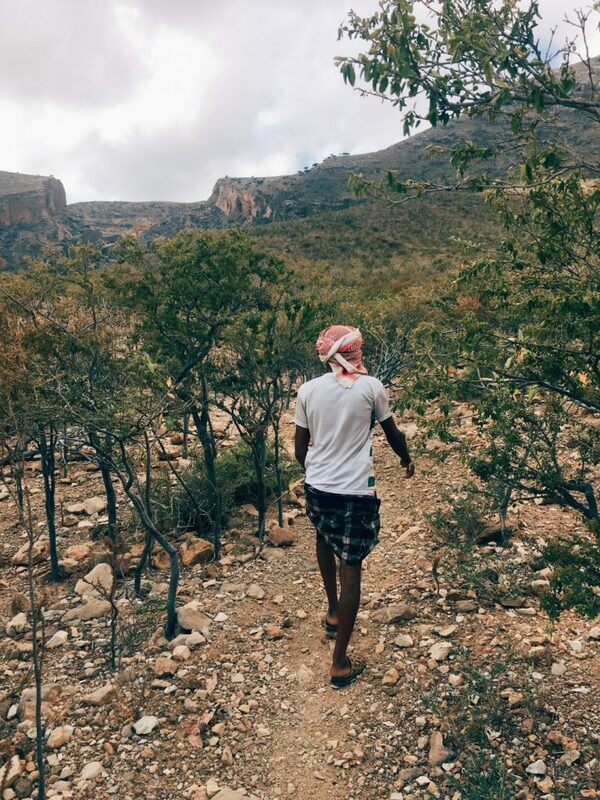 He was so happy to see a tourist in Socotra :). He has not traveled to his home in last 5 years and your story really turned him nostalgic. 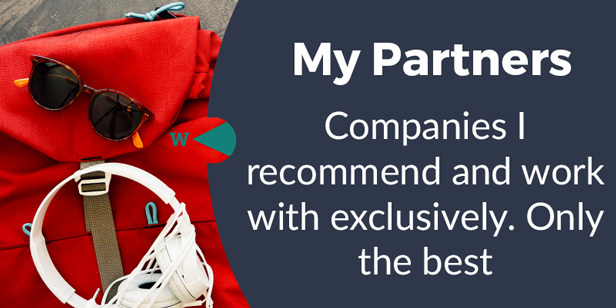 This sounds like quite the adventure but definitely worth it – what a beautiful place! 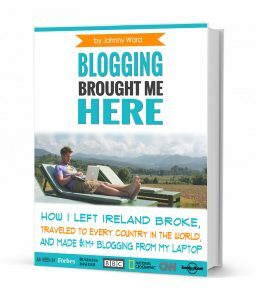 Awesome post Johnny, I enjoyed reading every bit of it. So glad you made it! Thank you for sharing photos with the world. 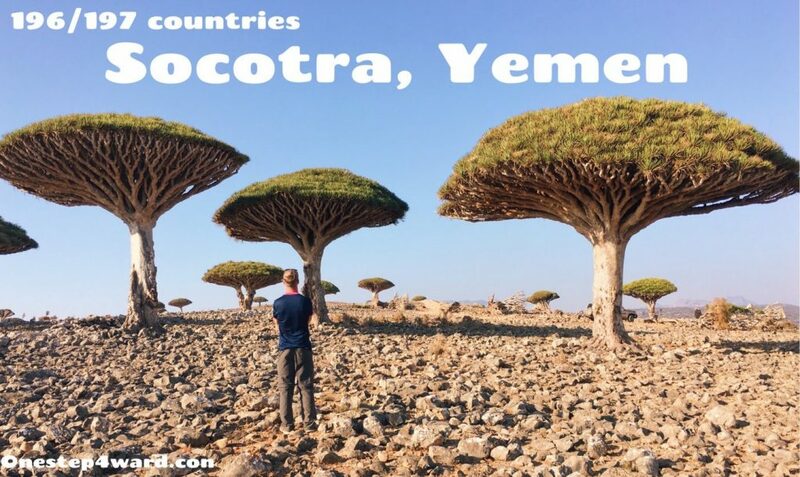 Socotra is on my list too. Loved the article and pictures. I’m going, that0s all there is to it. 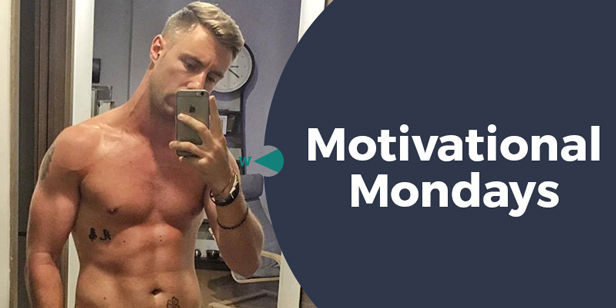 So inspirational, thank you as always Johnny. Another heart-warming read. 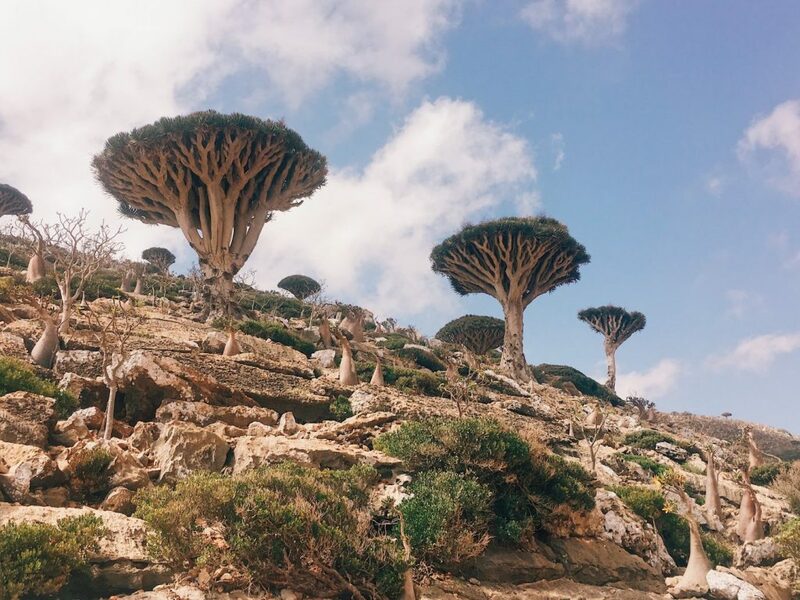 I feel like I wanna teleport to Socotra right this very moment, thanks to you! With the ongoing Civil War on the mainland and the closing off of the airspace by the Saudis, how have the Socotris adapted to the current situation? Have they found ways to increase self-sufficiency until the situation resolves itself eventually? Or are they 100% dependent on food and building supplies being shipped in on the treacherous waters surrounding it? Just like Ray, I would like to know the answers to these questions too. But I’ve got to tell you Johnny, those images of the trees are simply amazing. I just can’t get over them – I’ve never seen anything like this before! While I enjoyed the story, it is your high quality images that have captivated me. Sadly ….. All supplies being shipped in on the treacherous waters ….